During the late 1960s, salvage recording was carried out in advance of the construction of a new Cadbury-Schweppes factory on the north bank of the River Swale opposite Catterick Roman town (Cataractonium). This recorded part of Dere Street Roman road flanked by buildings that formed part of a northern suburb to the settlement. Subsequent investigations confirmed the presence of an extensive ‘bridgehead’ settlement. At the start of the 21st century, the former Cadbury-Schweppes site was again redeveloped, and as part of this work, NAA was commissioned to investigate a raised area of land in one corner of the site that had escaped the 1960s levelling of the site. 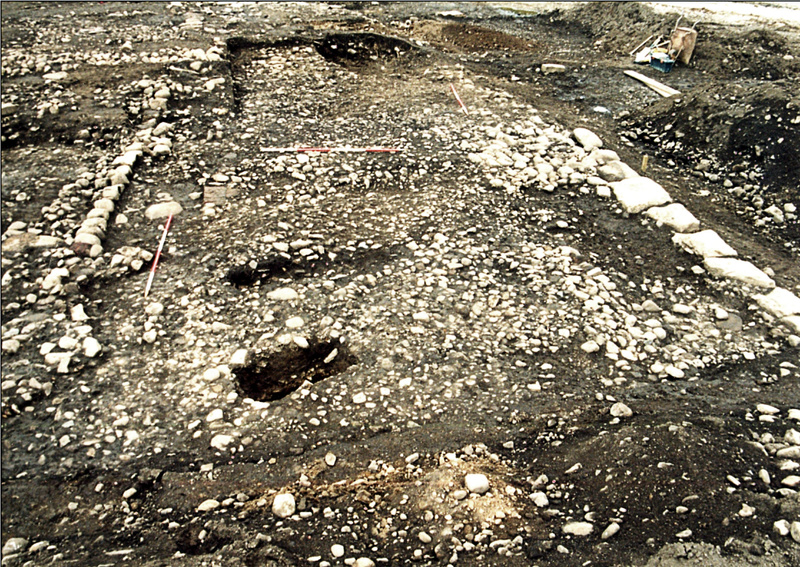 The resulting excavation revealed several phases of Dere Street Roman road, the main route north from York towards Corbridge, Hadrian’s Wall and southern Scotland. The road was flanked on its eastern side by a sequence of timber and stone structures that ranged in date from the late 1st to the late 4th or early 5th century. Five inhumation burials were identified. These were cut into the later part of the stratigraphy and had been buried during the late 3rd century or, more probably, later. Several were certainly of late 4th- or early 5th-century date based on the associated pottery. Four of the graves lay in a line that ran from north to south. 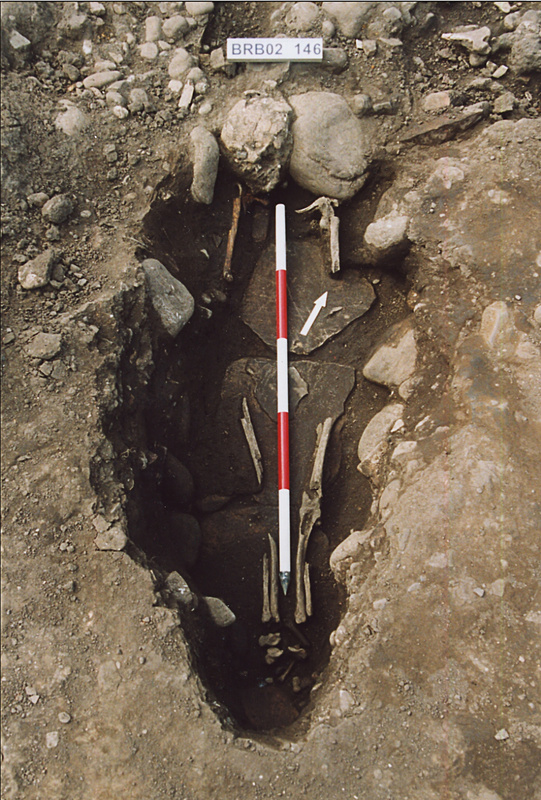 A further burial excavated a short distance to the south by John Wacher in the 1970s, also lay on the same line, suggesting that these graves were associated with an archaeologically invisible boundary, such as a fence or hedge that ran parallel to Dere Street. 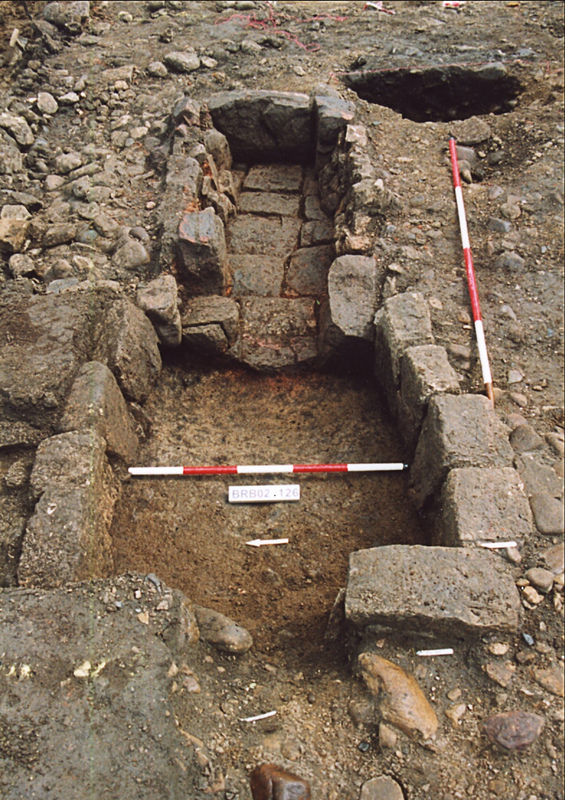 The fifth grave located during the Bridge Road excavation lay to the west, between these burials and the Roman road. 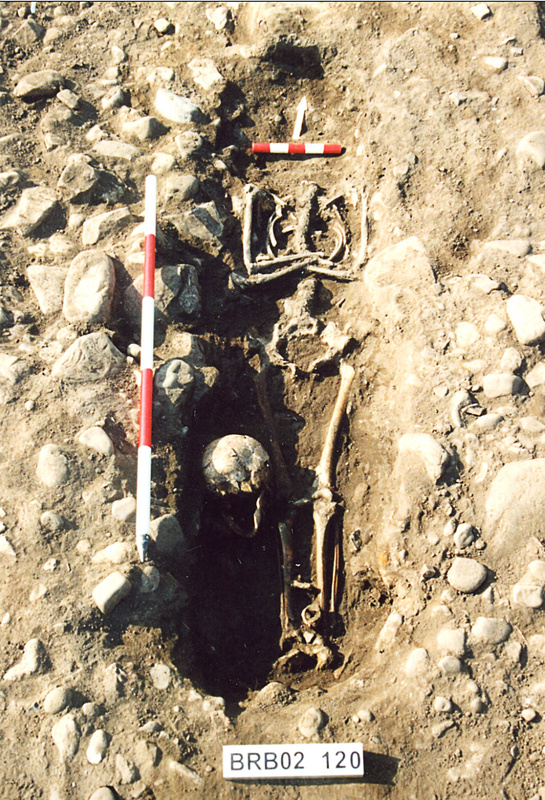 "Although this was only a small Roman funerary assemblage, its significance has been greatly enhanced, as it now forms part of a much larger group of Roman and early post-Roman burials, totally nearly 400, which have been excavated at various locations around the Roman town and the nearby roadside settlements at Bainesse and Scurragh House." Three of the burials were orientated with the head to the north or north-northwest, while the others lay with their heads to the east. All of the bodies lay on their backs in an extended position. The people buried here comprised a middle-adult woman, two elderly women, a possible adult male, and an unsexed adolescent aged 14–16. The adolescent had been decapitated with the head placed over the ankles, although during decomposition it had rolled off and come to rest next to the right knee, leaving a trail of vertebrae in its wake. That the head had room to roll was the only evidence for the use of coffins, which were presumed to be of non-nailed construction. Grave goods were restricted to near-identical small globular greyware (probably Crambeck Ware), which were found associated with two of the burials and have been dated to after c.AD360/370. Although this was only a small Roman funerary assemblage, its significance has been greatly enhanced, as it now forms part of a much larger group of Roman and early post-Roman burials, totally nearly 400, which have been excavated at various locations around the Roman town and the nearby roadside settlements at Bainesse and Scurragh House. NAA have recently carried out analysis of all of the burials from this wider area and what they can tell us about developing burial practices through the Roman period in the area and the identity of the deceased, the development of the settlements and the character of society which occupied them.